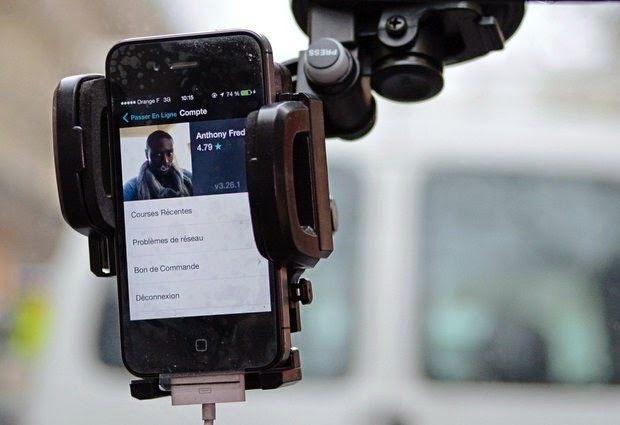 The photograph of UberPOP driver Anthony Loussala-Dubreas, 24, of Paris, is seen on his UberPOP application on his smartphone in his car in Paris, Friday, Dec. 12, 2014. A French court on Friday ordered Uber to withdraw from its mobile app to French users "all mention suggesting it is legal" for Uber's drivers to act like taxis — that is, driving around and waiting for clients. But the court did not ban the popular ride-hailing service. PARIS, FRANCE (AP) — Uber's low-cost ride ride-hailing service will be banned in France from the start of next year, the government said Monday as hundreds of taxi drivers blocked roads around Paris to protest what they claim are its unfair business practices. A new law tightening regulations for chauffeured rides will effectively ban the UberPop service as of Jan. 1, said Pierre-Henry Brandet, spokesman for France's Interior Ministry. "Currently, people who use UberPop are not protected if there is an accident. So not only is it illegal to offer this service but for the consumer there is a real danger," Brandet told the BFM television network. Several hundred taxis blocked the roads heading from the Roissy Charles de Gaulle airport, then inched toward the French capital in their latest protest of the ride-sharing company. France is the latest of several places where Uber has faced challenges to its service, which matches people seeking rides with drivers through a cellphone app. Traditional taxis say Uber has an unfair advantage because its drivers don't face the same requirements, insurance and taxes. On Friday, a French court stopped short of banning the company but ordered Uber to make changes, including omitting "all mention suggesting it is legal" for its drivers to act like taxis — that is, driving around and waiting for clients. Uber did not immediately respond to requests for comment Monday.